An old-fashioned adventure about mercenaries uncomfortably set amid present-day African political strife, The Wild Geese (1978) delivers the goods and then some, with plenty of exciting action. The film encountered uninformed protests when it was new wrongly labeling it as fascist, while in America poor distribution sabotaged it from becoming the great success it might otherwise have been. A home video label called Tango released it to DVD in 2005, but that was inadequately presented in non-enhanced 1.85:1 widescreen and had color timing issues and other problems. This new Blu-ray, from Severin Films is fairly good, though not as strong as Ashanti, a concurrent release. This transfer seems to source secondary film elements, including scratched film, and has digital artifacting issues, though these are relatively easy to overlook. The disc (which also includes Severin's DVD version) carries over previously released extras while adding several enjoyable new ones. When in the mid-1970s the British film industry fell into a state of near-total collapse, one reaction was all-star adventure epics, from The Wild Geese and its follow-up, The Sea Wolves: The Last Charge of the Calcutta Light Horse (1980) to Escape to Athena (1979), North Sea Hijiack/ ffolkes (1980), to partly British ventures like A Bridge Too Far (1977) and Victory (1981). Many of the stars and supporting actors in The Wild Geese turned up in one or more of these films, too. In The Wild Geese, Richard Burton stars as Col. Faulkner, a mercenary hired by Sir Edward Matherson (Stewart Granger) to fly into "Zembala" in Africa and rescue a deposed president, Julius Limbali (Winston Ntshona), thought dead but actually held in a remote political prison. After recruiting Shawn Fynn (Roger Moore), Rafer Janders (Richard Harris), South African Pieter Coetze (Hardy Kruger) and about 50 others, the men are trained and in no time parachute into Zembala. The picture follows the tried-and-true formula successfully mined in films like The Guns of Navarone (1961) and The Dirty Dozen (1967), with the usual mix of male-bonding, hoary military stereotypes (especially a ridiculously obvious foreshadowing of one major character's death and Jack Watson's supremely loyal Regimental Sergeant-Major for instance), detailed briefings, last-minute snafus, double-crosses, and apocalyptic shoot-outs. The film does well in all these departments, particularly in keeping the viewer interested with a building momentum leading to several terrifically tense action set pieces. Reginald Rose's script, from Daniel Carney's novel, cleverly varies the motivations of the mercenaries: some are in it to support the high-living to which they have become accustomed, while others are aging career soldiers looking for one last great adventure. Still others believe in the cause, while some desperately need the money to meet next month's rent or to secure a quiet retirement. Similarly, the script doesn't ignore or condone the inherent moral contradictions of mercenary life. The characters talk about, criticize and defend their chosen profession (and, in one case, their racism), and while the film ultimately comes off as naïve and superficial, it's certainly not fascist as contemporary protesters assumed. Roger Moore was in the midst of his seven-film run as James Bond, but the film wisely brushes aside any such comparisons with that character right away, with Shawn Fynn's introduction. Having hired himself out on what he thought was an assignment to smuggle money into England, Fynn realizes that in fact he's been duped into carrying cyanide-laced heroin, and in a surprisingly grim scene at gunpoint forces kingpin Sonny (David Ladd, son of Alan) to eat the stuff. Several of Moore's Bond colleagues worked on the picture: Maurice Binder did the titles, John Glen was its editor, Syd Cain did the production design, and Bob Simmons had a hand in the stuntwork. The picture abounds in familiar character actors, among others Frank Finlay turns up as an Irish missionary, Kenneth Griffith plays an outrageously gay medical officer, Jack Watson and Ronald Fraser have good scenes as mercenaries, while Patrick Allen, Barry Foster, and Terence Longdon are effective as mysterious government types. Glyn Baker, the instantly recognizable son of Stanley Baker, (who died in 1976) also appears. The Wild Geese was shot in spherical Panavision for 1.85:1 release. As noted above, the Blu-ray is a big improvement over the 2005 DVD, but it's still a long ways from perfect. Partly the film elements sourced aren't the best; there are highly visible scratches around the 28:20 mark, for instance, and the image is on the soft side. Rights are held by the film's producer, Euan Lloyd, and there are similar issues with the Japanese Blu-ray of Paper Tiger (1975), another Lloyd-owned title. The transfer compounds the problem somewhat, as there is much noticeable artifacting during the film's big action scenes. It's not a bad transfer considering, but there's much room for improvement. The 2.0 Dolby Digital audio (English only, no subtitle options) is generally good, though the film's title song is noticeably distorted for some reason. Like the earlier DVD, the new Blu-ray of The Wild Geese is fairly packed with extras, and fans of the film won't be disappointed here. Included are two brand-new interviews with a pair of 92-year-olds. The Wild Geese Director talks with director Andrew V. MacLaglen, surely the only director still kicking around who can claim five John Wayne movies on his résumé. Both he and military advisor Mike Hoare (in The Mercenary) have lots of interesting things to say about the movie and their respective areas of expertise generally. Carried over from the DVD release is The Last of the Gentleman Producers, a 37-minute 2003 documentary on producer Euan Lloyd, in which he discusses his career and is joined by Roger Moore, an unrecognizable Ingrid Pitt, actor Kenneth Griffith, actress-daughter Rosalind Lloyd, editor John Glen, title song singer Joan Armatrading, producer Norman Spencer, and Film Services' Sydney Samuelson. The show includes clips and other tantalizing footage from Lloyd's career, including excerpts or stills from such films as Poppies Are Also Flowers (1966), Shalako (1968), Paper Tiger, and others. Next is Wild Geese Premiere Footage, which runs seven minutes, is 4:3 standard format, and is in excellent condition with good color. The film was apparently made for theatrical release by British Movietone News, and is a star-studded charity gathering at the Leicester Square Theater sponsored by the Variety Club. Next is Stars' War: The Flight of the Wild Geese, a 24-minute behind-the-scenes film shot in 1978 and thankfully featuring interviews with several stars that have since passed away, including Burton and Harris. The show is better than most such films, offering a detailed look at the difficulties of mounting a major production in far-off Transvaal. A detailed Audio Commentary Track finds historian Jonathan Sothcott interviewing producer Euan Lloyd and Roger Moore was much more inviting. Finally, a Theatrical Trailer rounds out the package. 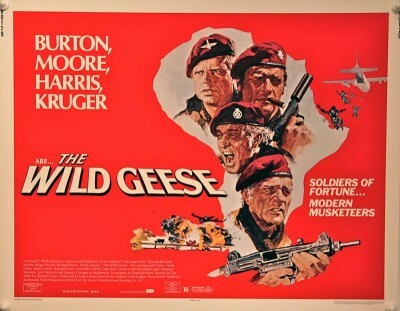 The Wild Geese is a rollicking if by-the-book variation of other, superior films like The Guns of Navarone and Where Eagles Dare, but for its cast and lively energy it's still loads of fun. The transfer is problematic, but the extensive extra features compensate somewhat. Highly Recommended. * Sergei Hasenecz writes, "In 1980/81 I worked at the Pantages Theatre in Hollywood, where one of the productions was Camelot starring Burton as King Arthur. After some time he dropped out due to needed back surgery, and Harris replaced him. I saw both versions and it was fascinating to contrast the two performances. There is a scene at the end of the play between Arthur and a boy named Tom of Warwick. Arthur knights him and tells him of the ideals of chivalry before sending him off. Both Burton and Harris were excellent in the role, but Harris's portrayal was more openly emotional. I was reminded of his scenes with his son in Wild Geese when I saw him as King Arthur, which was a couple years after the movie was released."